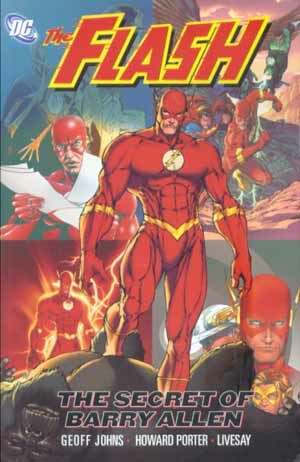 Well, no one is going to accuse Geoff Johns of decompressed storytelling with The Flash: The Secret of Barry Allen. One minute Wally is fighting Abra Kadabra, the next minute he's running alongside Jay Garrick. Blink and he's up on the Watchtower, racing Superman, teaming up with Nightwing, talking to Green Arrow, visiting his Aunt Iris, talking to Green Arrow again ... and that's without the way the stories whip and weave through Identity Crisis. Frankly, so much happens in this trade, it's sometimes hard to get a handle on it all, but with appearances by nearly every character in the DCU, you're bound to find something to enjoy while you're reading it. The Secret of Barry Allen picks up immediately after the end of The Flash: Ignition, and it is essentially--speed-stealing villains, tampered breaks, and mindwipes aside--about Wally coming to terms with the absence of his wife, Linda. His ultimate decision makes sense--and works, in the rubric of Geoff Johns' grand redefining of Wally West as "the blue collar hero"--though the decision's resonance suffers due to the crossover-heavy nature of the trade. Wally chooses to stay with Linda, to continue their relationship, because to leave her for safety's sake would be to let the villains win. Which makes sense, except that the "villain" in question was Jean Loring, and her whole intention was for the heroes to grow closer to their loved ones. It doesn't quite make sense. Additionally, we only "hear" about heroes distancing themselves from their families through Wally's dialogue; it isn't brought home to us, and it doesn't seem real. It's hard to admire Wally for being different when "different" isn't shown. And such is the works/doesn't work relationship that this trade has with Identity Crisis. The trade fills in some gaps in the miniseries--the aftermath of the JLA/Deathstroke fight, played out on the Watchtower--and while these gaps didn't necessarily scream out for filling, Johns makes the most of them, offering a nice Kyle Rayner moment in the above instance. And a scene of Elongated Man, Zatanna and others in the Watchtower prior to Identity Crisis does a good job of "placing" these characters before the miniseries. At the same time, it sometimes felt like The Flash was rewriting Identity Crisis unnecessarily. It's hard to take seriously Green Arrow's claim in Identity Crisis that the JLA never mind-wiped a villain after Dr. Light, when The Flash shows they never did it again--except once! And Wally exits the trade with a conversation with Batman that, while interesting, seems better to have appeared in a Batman or Robin comic book--again, The Flash taking a vaunted but somewhat awkward role as Identity Crisis's spokesperson. Finally, Geoff Johns again shows his strengths with the trade's supporting characters. His somewhat wishy-washy Linda Park has always been a sore spot for me, but I continue to love his use of the Reverse Linda, Ashley Zolomon, toward pure metaphoric bliss. Zolomon's "stand by your man" promise to Zoom plays well off Wally's marital troubles, and I loved the interaction between Wally and Ashley Zolomon--up through and including the unexpected mid-trade twist. The small glimpses of Mirror Master's drug problem also works to humanize the Rogues. The Flash: The Secret of Barry Allen is a perfect bridge betweem the Identity and Infinite Crisis, with a Villains United cameo in the end. The trade also crystalizes Geoff Johns' vision for the Flash--he's the hero that saves your life, and changes your car's oil while he's at it. It's fresh, it's interesting, and it's a shame that Johns is leaving the series--I hope the next writer keeps this approach. Now on to the JSA Identity Crisis crossover, JSA: Lost, and then maybe Green Lantern: Rebirth. Happy belated Thanksgiving, all!